In case you're wondering, I'm still around, and there is creativity going on - I just can't show most it yet as it's for the Great Cubby Hole Exhibition next month, aka "Celebrating the Diversity Again". Which is a pity as it's really, really impressive. Well, it impressed me, so that's good enough. I've had a couple of weekends away in the van with friends; one of which was wet, and the other wasn't. Both enjoyable though. 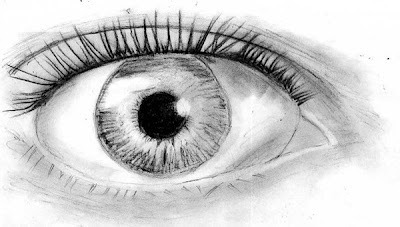 The eye is the result of one of the tasks on the Wright Brain eCourse, focusing on looking and drawing what you see. It may possibly be the basis for one of my exhibition pieces. EYE see a wonderful drawing Nigel!!! i'm catching up on so many blogs - seem to have less and less time these days for all the fun stuff.